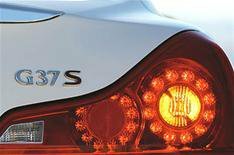 Infiniti G37S: our cars blog | What Car? 'Prepare to be stared at,' the Infiniti PR man said to me on the day I picked up our long-term G37S Coupe. I must confess to a degree of scepticism it's a pretty car, but so are lots of coupes however, it turns out he was right. Last Sunday I parked it on London's Piccadilly, where fashionable cars are two a penny, and came back to find it surrounded by a gaggle of Italians. Their interest may have been aroused by its rarity in their homeland 3.7-litre V6 coupes aren't found on every street corner in a country where there are some punitive motoring taxes but they were obviously impressed. All the people in the office who have driven it are also impressed. The G37 has now chalked up its first 1000 miles in our hands, and so far it's thumbs-up all round. It has even made its first film our video road test crew borrowed it for three half-days to shoot it on our test track and in our studio. Those 1000 miles have included a first opportunity to put the sat-nav to the test while trying to find former McLaren designer Gordon Murray's studio buried away in Surrey, and a 450-miles-in-a-day trek to Yorkshire, as well as the usual commuter/family duties stuff. It has done the lot with panache. The sat-nav easily coped with my wilful disobedience of its instructions on a couple of occasions (it wanted to send me through the middle of Guildford in the rush hour; I refused), while the car's mile-munching capabilities were impressive on that trip north. The only thing I haven't got used to yet, after a succession of economical diesels as long-term cars, is having to keep a more careful watch on the fuel gauge. Let's just say we're not even matching the 26.9mpg official figure. The Infiniti equally enjoyable to drive whether you're pushing it or just letting the V6 engine and seven-speed automatic gearbox waft it along; the cabin is snug and comfortable; and I can't think of a single item of equipment other than a fully-integrated MP3-player connection I'd add. The dealer service is all I was promised, too. My 'personal consultant', Nigel Spragg, rang to ask me if I wanted a second handover as a refresher of all the car's controls (all part of the regular service, apparently), but I haven't had time to take him up on it yet. Anyway, we're getting along just fine as it is.